Cliff jumping, or cliff diving, is sketchy. It’s not for everyone, and everyone shouldn’t do it. 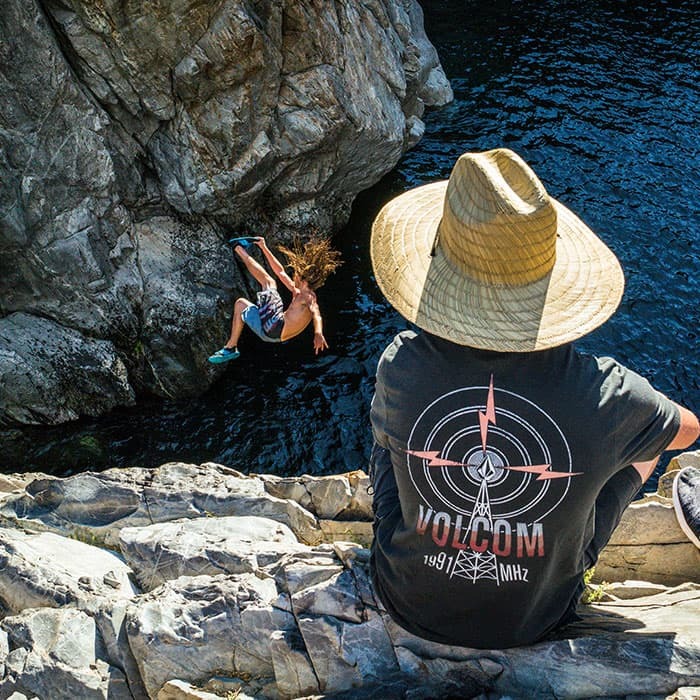 Leave it to guys like Robert Wall and his crew who have been hitting huge cliff jumping spots around California, Washington, and even abroad in Greece and Costa Rica, among other places. The best cliff jumping spots are subjective depending on your desires, but for these guys, the bigger the better. Whether it’s cliff jumping a 100-foot waterfall or flipping into a narrow 30-foot watering hole, these guys aren’t scared (or at least they don’t show it). Adrenaline junkies? You bet. But, they do it for more than just the excitement. It’s a passion. A calling. 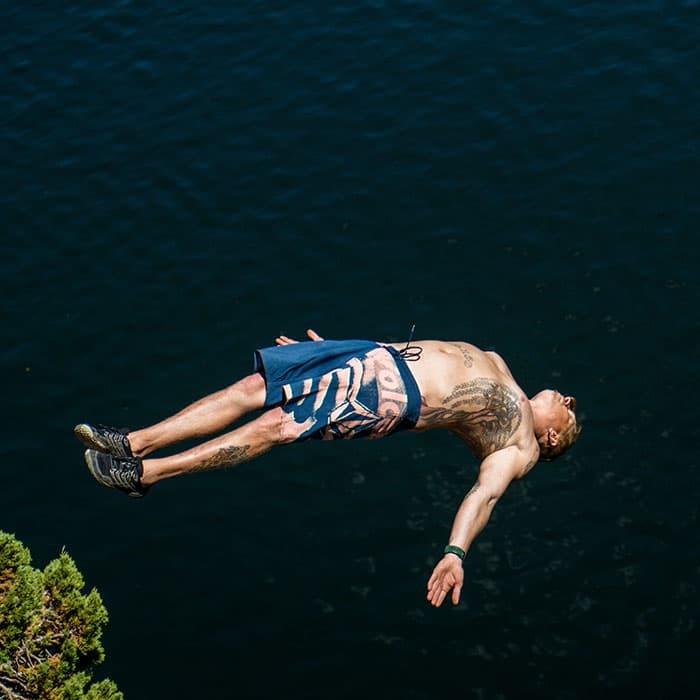 For guys like Robert, cliff diving is a hobby that turned into a passion, which now consumes his life. An avocation that enables an active, healthy lifestyle, surrounded by friends and nature, pushing each other to go further. Seeking for the next biggest cliff to throw oneself off of. And although it may look reckless, it’s carefully articulated and strategically planned. Each step of the way, each breath, each foot dropped. How to cliff jump? On paper it sounds simple, right? But, with any extreme sports there are a handful of variables that could go wrong at any moment. Jumping off a cliff into the naked air, unrestrained and free for those few brief moments, is popular among many athletes who choose to go skydiving, base jumping, bungee jumping, and cliff diving. We wanted to find out for ourselves why and how this is done, so we caught up with Robert Wall after he and his friends recently were cliff jumping Lake Tahoe, CA, to get the cliff jumping how-to guide, where the most sought-after spots are, what gear to pack, the different tricks they throw down, and how to do it properly and safely. Scroll below to find out! What are some of the cliff jumping spots in this video? ROBERT WALL: First spot is called Emigrant Gap, CA. Only about 35-feet tall, but really technical with how narrow the landing area is. Next is Emerald Pools, CA. One of our favorite spots to go with the highest cliff being 68 feet. Lastly, we set up the rope swing on the west shore of Lake Tahoe. The swing is roughly 100 feet in length and drops you from about 70-80 feet in the air. When rope swinging off of a cliff, how do you secure the rope? RW: The rope swing is actually a fairly complex set up. At least for this one. We had 3 anchor points on each side with a cable running across the canyon. We then dropped another cable down from our main cable to attach the handle, and then setup a tree stand for us to drop out of. It took three total weekends of preparation to ensure we had everything 100% good to go. Best season to go cliff jumping? RW: Best season is from around May to September. The water levels are lower this time of year, making it a lot less dangerous. Also, warm weather is always a plus. The Mod Tech Surf Bag is made for more than the beach – it’s made for the outdoor enthusiasts! A perfect travel bag to take to the mountains or those weekend getaways where you need a place to store everything separately. Featuring a secure wetsuit bag, many compartments, and several other utilities, this bag is seamless and comfortable to throw on your back. Best time of day to cliff jump? RW: I love afternoon sessions. Mornings and evenings have great lighting for shooting, but from about 3pm – 5pm is usually best. This can change from spot to spot though. Basically, you just want to hit it when the landing area is most lightened up by the sun. Do the tides factor in as to when to jump? RW: Yes, this is something I didn’t have experience with until jumping into the ocean for the first time in Hawaii in 2016. Not only can this change the depth of the water, but strong tides can make jumpable places turn into a washing machine of death. Jumping into the ocean has many different safety precautions to take into account than jumping off a waterfall or a cliff. What gear do you pack for cliff jumping? RW: The necessities are my wetsuit (if needed, depending on time of year or water temp), loads of camera gear, a safety rope, a tape measure, goggles for checking depth, and victory beers for after everyone jumps. The Liberate Mod boardshorts are designed for surfing and recommended for life! This short throws down mega doses of stretch and performance to enhance that leap over the edge. Including a 4-way stretch elastane, side zip pocket, and Cinch Fly Technology for a smooth and secure fit, this quick-drying boardshort that’s enhanced with recycled polyester is perfect for the beach, lake, or anywhere you find yourself in water! How do you train for cliff jumping? RW: I do a little bit of everything. Staying active and doing other hobbies like free running, snowboarding, hiking, etc, are my favorites. But, when it comes to actual training, I do a lot of cardio and body weight workouts. You don’t need bulk for cliff jumping. A strong core and legs are definitely the most important. It’s all about having usable muscle. Have you ever injured yourself cliff jumping? RW: Luckily, aside from a few bruises and sore muscles, I haven’t been seriously injured. For me, whenever I am on a cliff that has a serious danger factor, it’s almost as if I go into survival mode. I’m so concentrated on every detail that is going into the jump that my mind knows I can’t mess up in anyway. What are some cliff jumping tricks you guys do? Anything you are working on now? RW: This summer it seems like a triple flip is the new double. We have really tried to progress the flips being thrown. We try to combine traditional diving tricks, but throwing our own added style with grabs, tweaks, pauses, and more to try and make it unique to our own style. One of my personal goals for this year is to throw my first quadruple flip off of a waterfall. Last year I got my triple halves down (triple front flip with a 180 rotation on the last flip), so I really want to stomp a quad half this year. Favorite spots to go cliff jumping outside of Tahoe? How did you get into cliff jumping and why do you do it? RW: I got into cliff jumping because of the environment I grew up in. In the mountains of NorCal there were at least six or seven jumpable waterfalls all within an hour of my house. It started off as just a fun activity to pass the time in the summer, and now it has turned into a year-around passion consuming almost all of my time. Apart from the crazy adrenaline from jumps, trying to constantly put out edits and create videos, it’s more about just enjoying the amazing locations that mother nature has to offer. The fact that me and my friends come together from various states to one location all for something as random as cliff jumping is amazing. It just shows that it is truly a movement of trying to better yourself and live a healthy, active lifestyle. And trip after trip it seems that my love for the adventure grows and grows. It has truly become an addiction at this point and drives me to better myself everyday. The Rebel Radio Short Sleeve Tee is cranking at unprecedented megahertz to bring you the lifestyle you desire – much like these guys. Biggest cliff jumping spot you’ve hit? RW: My highest jump is Magia Blanca Falls in Costa Rica. The signs at the park say the falls is 120 feet.